After this interview, I am convinced that the number of rising artists with the intention of love and peace is growing in Arizona. Art allows the self to express and when there are people expressing the emotions of what it means to be human and being grateful for the experience, it is obvious art can be a beautiful way to negate the negativity. When first listening to Psilosapiens, my first impression showed me an eclectic group would evoke love in their music, and would like to shed light on good music. If you feel like it could be your vibe, I would suggest checking out a show and following them on all platforms as soon as possible. When scrolling past one of their recent posts on Instagram, I took a listen to their newest single at the time, “We Are,” and after just a moment of listening to the track, I was impressed. After listening to “We Are” just once, the melody of the track got stuck in my head, and I quickly became a fan of the trio. The Psilosapiens’ sound is a beautiful blend of a variety of genres. 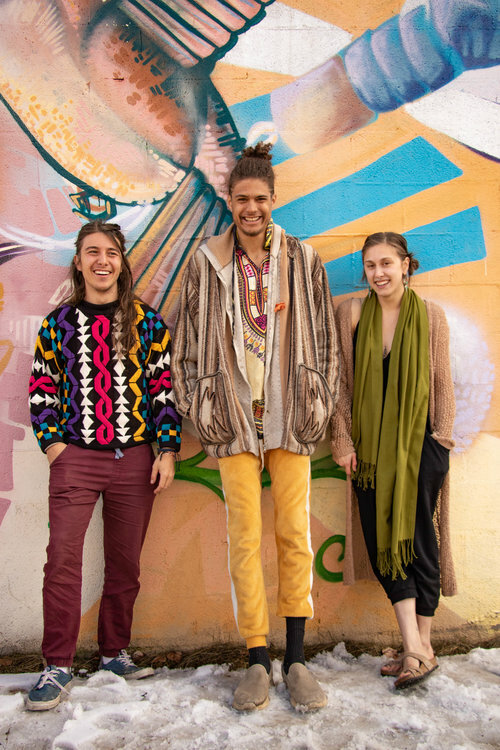 “The Psilosapiens fuse hip hop, rap, loopers, synthesizers, didgeridoos, flutes, guitars, violins” and their positive and poetic lyrics to create a one-of-a-kind vibrating sound. Luckily, I was successful at landing an interview with Stefan, Cooper, and Summer, where I learned more about the band’s story of origin and inspiration. If you’re in Northern Arizona and itching for an unheard sound, watch and listen to The Psilosapiens perform this Saturday on April 20th at Cornish Pasty’s 3rd Annual 4/20 Bash. You will not be disappointed! How did The Psilosapiens come together? While you were escaping the forest fire, did you think you might die? “Oh yeah, in one moment, I saw a wall of flames about two football fields away from me and the animal in me told me ‘yep, I am going to die (Summer)’”. Everyone in the whole group of people ended up okay which is crazy. We ended up hiking nearly 13 miles throughout the night, which was so cool. We got to see a beautiful waterfall late at night. It was glowing. We were probably one of the only few people who got to see that. It’s pretty cool because before this all happened, Cooper was playing a new song, “Here We Go” as we were hiking in one day, and we were all just jamming out. I feel like it helped everyone stay calm during the panic. Cooper: Before The Psilosapiens, I was a painter. I also knew the didgeridoo and started playing guitar. I started to create music as a form of healing. I picked up a loop pedal, then got a bigger pedal. I also play violin, Native American flute, and beatbox. Summer: Initially, my weapon of choice was dance. I have been dancing for over 15 years. I started painting in college. Now I sing, and even rap. My artistic medium definitely moved from movement to auditory art. Singing is definitely my favorite right now. Stefan: Writing has always been a huge passion of mine. I also enjoy rapping, music, and dancing. Are The Psilosapiens working on an album? We have enough songs for an album but we don’t have enough recorded songs for an album. We have two singles out right now, “We Are” and “Peace, Love, & Unit,” and are currently working on songs. Our newest song “Hare Krishna” will be released soon on all platforms. What can fans expect from you in 2019? Our fans expect videos, a website, more shows, and more music. You can also expect more fundraisers. We’ve raised $2500 so far in Flagstaff for non-profit organizations. The first one was for DACA and the second was for Taala Hooghan. Any words for people listening to your music? Our intention is to inspire peace, love, and unity through diversity.